The G-Force, compose of some staff members of Central Philippine University, went on a two-day discovery 2011 at Tibiao, Antique on May 26 to 27. Resting a bit before leaving Bugtong-Bato Falls to go back to Brgy. Tuno. The G-Force appreciates the presence of Flord (red shirt) and Krista (yellow shirt) who guided their trek. It was already noon time when the G-Force finished their trip from Bugtong-Bato. They proceeded to Kayak Inn, the venue for their next activity… Kayaking. After a hearty lunch, three G-Force members don the kayaking attire. Cyrus decided to rest, while Jonan soothed his tired body at the Kawa hot bath. Beneath the smiles of the G-Force Kayakers, a mix of excitement and eagerness pervaded their spirit. The walk to the training site added to the suspense. Jones, Joan, and May were the three G-Force who went Kayaking. The Kayak neophytes were brought to Grade 1 (still waters) for orientation and quick training. Kayaking is a mix of paddling and balance, which May finally mastered. It's easy to build confidence in the smooth water, what do you think Jones? With great determination despite falling into the water once, Joan finally overcame her fear. 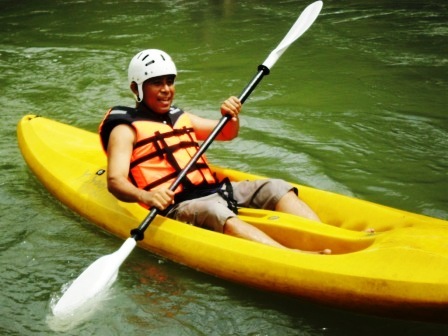 After the crash course, Jones shot the Tibiao River Rapids…finishing 12 Kayaking stations. Watch out for more G-Force’s Katahum Tibaio Adventures…next post! It looks like the sea would not favor our chance to witness the Lambaklad fish haul. Later, Flord sent Joan a message that they will proceed as planned. The G-Force cheered. Sporadic heavy rains marked the whole night until early morning, which dampened the G-Force’s schedule to move out at 5:00 in the morning. The G-Force was supposed to ride the bamboo raft with the fishermen but the big waves were too much for them. They were set to go to Brgy. Malabor, two kilometers from Tibiao town, to witness the fishermen bring in their fish harvest. About 12 fishermen riding on a wide bamboo raft braved the heavy waves, pulled the nets, and gathered the catch. Despite stormy weather, the Lambaklad nets yield 44 kilos of Bayang and several kilos of Bulaw. G-Force bought two Bayangs; Flord gifted them with one. Each Bayang weighs 2.5 Kgm. Proudly, showing their spoils. The banana is courtesy of Flord, a token from their family orchard. G-Force gave Flord some CPU tokens, their way of promoting CPU wherever they go. 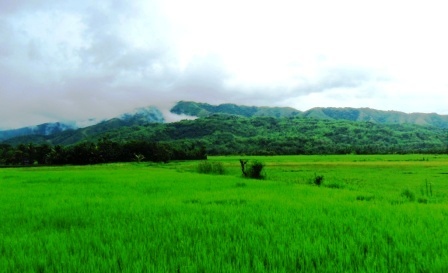 The G-Force just marveled at Tibiao's verdant hills and vales. They had no idea what surprises awaited them at Bugtong Bato. From Brgy. Malabor, G-Force went back to town to have breakfast. They ate at Vbot’s Restaurant where they enjoyed sinabawan nga Tangigue, among other food. They also requested Nang Vbot to fry the Bulaw that they bought from Malabor fisher folks. The G-Force brought packed lunch to Bugtong-Bato. Taking a brief pause after climbing the first slope. The site is way up the mountains with Che (rightmost) and Crista (taking the photo) as their local guides. 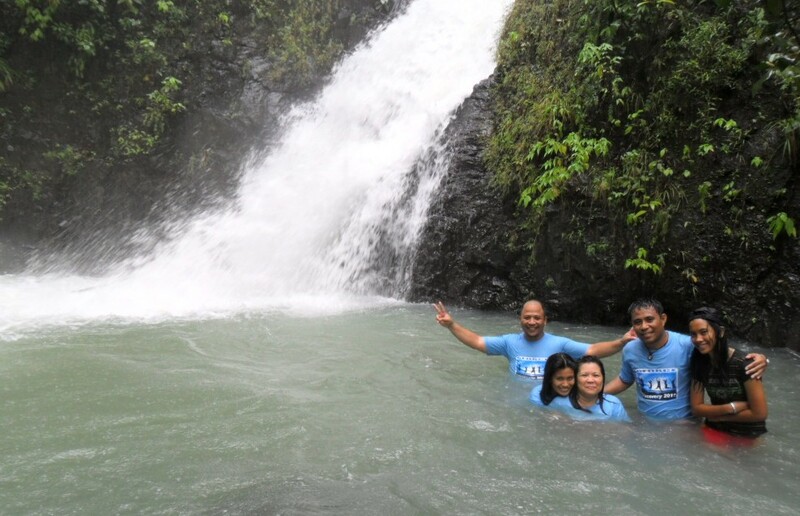 Enjoying the best of times at Bugtong-Bato Falls. Taking a pose with the Tibiao Mayor, Hon. Walden M. Lim (center) during the G-Force's courtesy call. The rain had stopped but the skies remained cloudy. It was already past 3:00 in the afternoon of May 26, 2011. Being Centralians, the G-Force took time to visit Mayor Walden Lim in his office upon arrival at Tibiao town. Besides doing the customary courtesy call to the town leader of every place that the G-Force visits, it is also their pride and honor to meet a fellow-Centralian who is leading the progressive town of Tibiao. We are here! Taking a photo with GM Flord at his Tibiao Fish Spa sign. For them, it is great opportunity to hear and learn from Mayor Lim his vision and plans for his constituents. Thus, when Jones asked him what his priority project for the Tibiao people is, Mayor Lim replied quickly and without hesitation, “farm-to-market roads”. They thought their day tour would start the following day but Flord lost no time in inviting the group to visit some sites nearby. Thus, Flord guided the G-Force to Tiguis Beach. 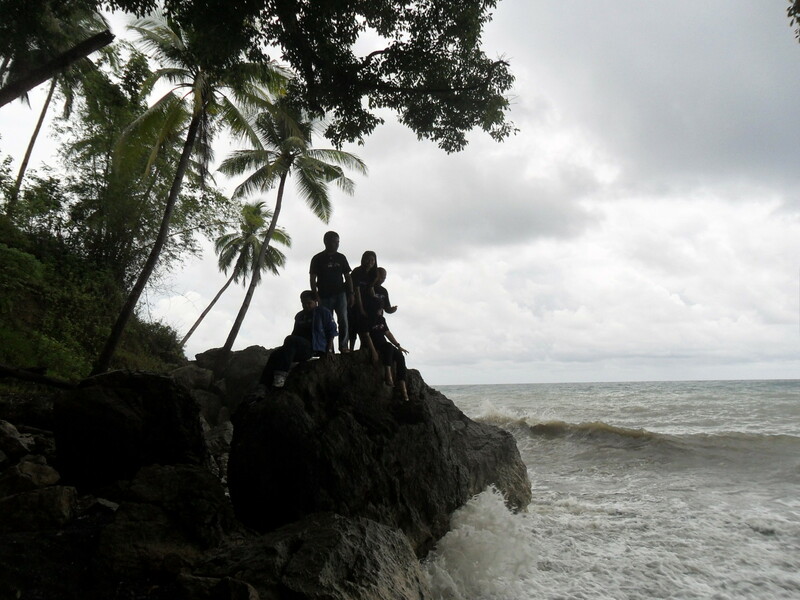 We negotiated steep slopes to reach Tibiao's popular seaside scene. Tiguis Beach is not your typical swim and dive beach. 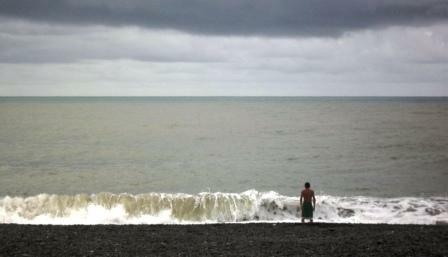 Tiguis Beach is one place to find peace by listening to the surf and learning from it. Tibiao is definitely on her way to progress because Mayor Lim, Flord, and her constituents are listening and learning from nature. Thus, they reap nature’s bountiful gifts. It is quite sad that there are leaders who neglect to listen to what nature and society are crying out because they are immersed with their pride and pretensions; leading themselves and their constituents towards self-destruction and hubris. Don't leave Tiguis Beach without getting a picture with the 100-year-old Balete Tree. Let’s go to Tiguis Beach and listen to the surf and get the message! Although it’s only about 5:00 PM, the dark cloudy sky and the scattered rain showers made it look like it was already dusk. This did not deter the G-Force to follow Flord to Manlamon Cave for some short spelunking adventure. Flord shared that according to folklore, one could travel through Manlamon cave and be transported to a nearby island by saying a magic word. Along the way, the traveler will be served with good food, fruits, and everything that would make your travel so memorable and comfortable. What the magic word is, no one knows nor not one of the G-Force would like to know. Life's challenges become light when we carry one another's burden. Doing a pose that is fitted for billboard promotion at the mouth of Manlamon Cave. Jonan was glad to exit without a hitch. No, the G-Force did not eat fish but instead they let those special kind of fishes eat their dead skin, leaving the soft and smooth dermis of their feet. At the Tibiao Fish Spa, the client undergoes three stages of treatment. You start with stage one with those little fish doing some kind of “micro-ex-foliation” of your skin. Then you progress to stages 2 and 3 with the spa being managed by medium to large fishes. Oh boy, the G-Force cannot give an exact description of what they went through at the fish spa. You better come to Tibiao Fish Spa and experience it yourself. Flord invited the G-Force to try the total Roman bath, a full-body fish treatment but nobody dared. For now, foot treatment was just enough. Getting used to the fish nibbles, the G-Force relaxed a bit at Stage 2. Stage 3 gives a smooth finishing 'touch' to our skin. Watch out for more Katahum Tibiao adventures…next blog post!